Apologies for this late organization - I had 1.5 weeks of medical issues to deal with. 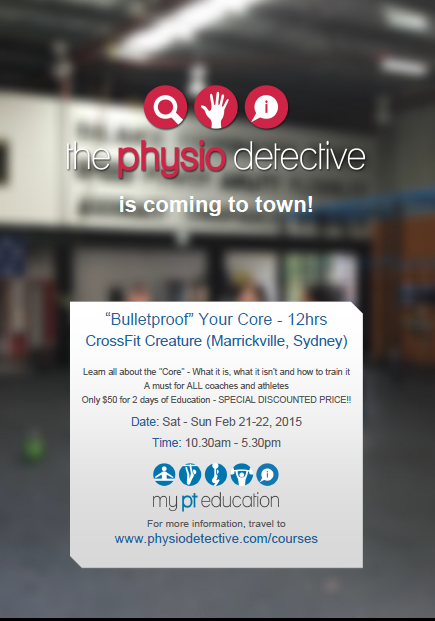 I will be providing a 2 day course on "The Core" - I hope to be able to take what we know from research, what we know from practical experience and explain how to retrain each component of "The Core" so you can provide yourself and your clients the strongest base from which you can build strength, power and speed. I will also be teaching a staged retraining model so you can help clients who have back pain all the way through to high level athletes. The total cost of this course is usually $660 but for this one time only in Sydney, I am offering it at $50. I don't want cost to be an issue and I want this information to be able to get out there. We will be filming and photographing extensively during the course. There are limited places so please click here to BOOK NOW! How to Activate Your Pelvic Floor With Breath Holding For Lifting / CrossFit / Everyday Life! Hope you are feeling alot better now. Just wondering is it possible to do just the sunday of the workshop as I work on saturdays or will I miss out on toooooo much? Hi Victoria – how can I forget you!? Yes, you will miss too much 🙁 the heavy, theoretical information is more on the first day than the second. I hope to have this course available online soon into the future. Hi Antony, is the material suitable for information-hungry clinicians without a working knowledge of Cross-fit? Hi, thanks for the info. I live in Geneva, Switzerland, and was wondering whether you were planning on offering this course as a webinar later. Where abouts in Sydney will this be held? Great thanks. See you there.